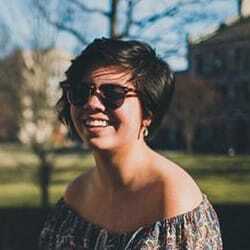 In fall of my senior year, I began interning at the International Rescue Committee, a global organization that works to create a better life for individuals seeking refuge. Their local office is in Highlandtown, a neighborhood in southeast Baltimore about eight miles from campus. I got to know a few facilities workers who took the bus with me, and when I asked them about their own experience, they all agreed that the waiting experience for the city bus could be better. This idea sat for months—until a professor from the department of communication encouraged me to submit it as a part of the student pitch and poster competition during Loyola’s annual Building a Better World Through Business. BBWTB is a series of events designed to celebrate the positive role of business in society and how it can work to transform the world through sustainable economic and social development. 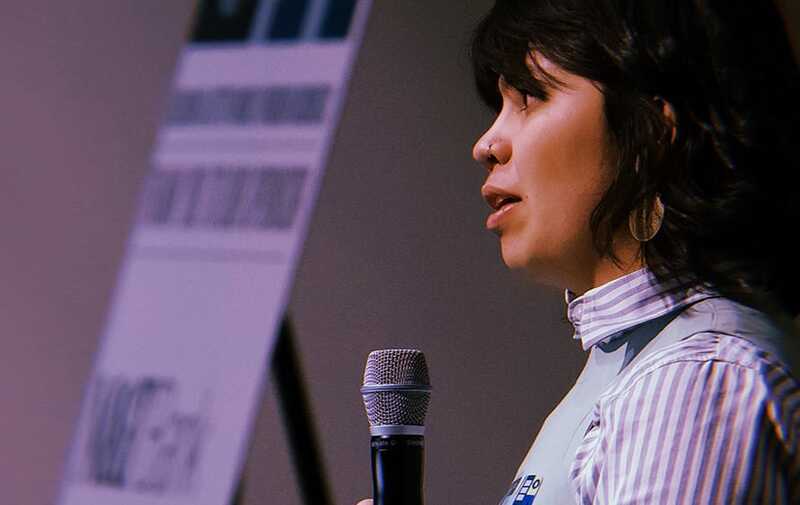 Each year the events include keynote speakers and programs—and a poster and pitch competition for students. Now, I should mention I’ve never taken a class with Dr. Paola Pascual-Ferra. We actually met in line at Starbucks in the student center, when she recognized me and asked me if I had presented at another event on campus (which I had). Our conversation revolved around any projects I was interested in, and eventually grew into the relationship we have today. I credit a lot of my success with my idea and my pitch to her. It came into being because of Dr. Pascual-Ferra’s encouragement. Before she asked if I was going to enter the competition, I hadn’t considered developing my idea into something I’d present to others. But then Dr. Pascual-Ferra told me this year’s poster and pitch competition was called “Rising to the Challenge: Ideas to Help Build a Better Baltimore,” and it called for proposals for innovative ideas and sustainable solutions that respond to challenges the Baltimore community currently faces. 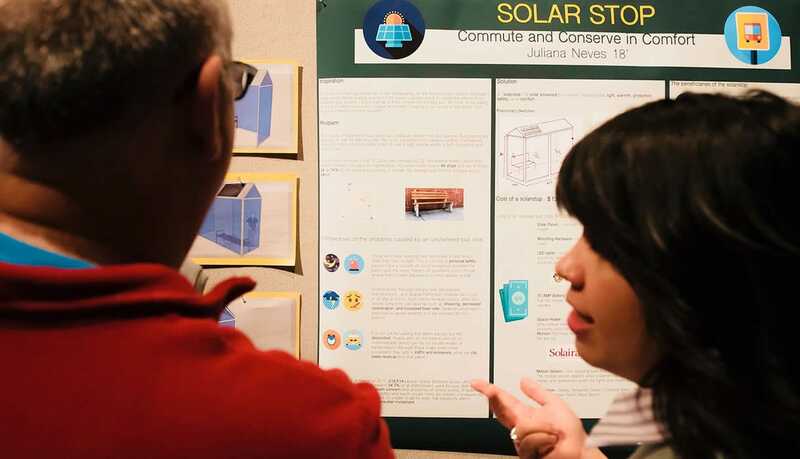 Student proposals had to respond to the challenge question: How might Loyola students apply their talents and education to create initiatives, ventures, or products designed to benefit and contribute to Baltimore’s growth? My idea seemed like a good fit. I already had a concept for how to improve Baltimore and the lives of those who use its public transportation system. I just needed to refine it. 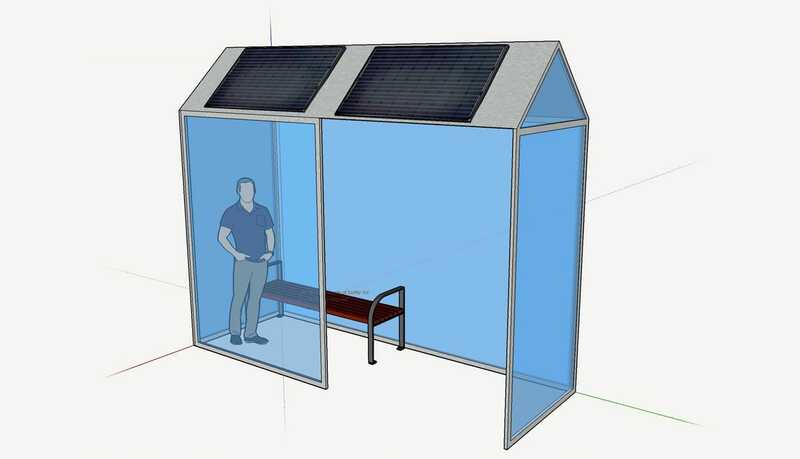 SolarStop is a solar-powered bus shelter that provides light, heat, and protection for people waiting for the bus. The shelter enhances the physical experience for current patrons, who have a place to take shelter from the elements, and it encourages new riders to start using the bus system. When I began formulating my pitch, I felt a sense of credibility. My purpose was to pitch the idea; to show the Loyola community that this a problem, but there is a possible solution. I’m not a civil engineer or a business entrepreneur, but I know how it feels to wait in the pouring rain for the bus. I knew that if the project was to eventually be completed, I would need the help of experts in other fields. Pitching teaches you how to sell your passion. People may not be as passionate as you are, but the whole goal is to invite them to understand and believe in your passion. Currently, I am working with Loyola’s engineering faculty, including Suzanne Keilson, Ph.D., assistant professor of engineering, to create a stronger pitch to present to the Innovation Task Force at Loyola for a larger grant. I hope to see a prototype installed at the bus stop on North Charles Street and Cold Spring Lane, right near campus. It’s a humbling experience to work with professors from other disciplines. They see what you don’t, they ask the questions you haven’t thought about, and they bring new ideas to the table. I love interdisciplinary collaboration, because it values each individual’s talents and experiences while respecting everyone’s own limitations. When we are tasked with solving a problem, we often think too big. We often focus on the ends, and we must solve the means. The small, the refined, the specific projects are both achievable and make a difference. 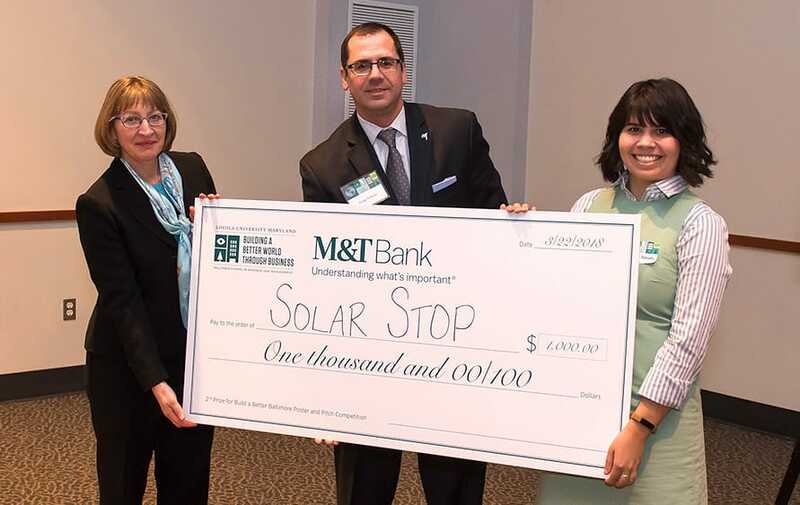 SolarStop does not stop global warming, but it helps Baltimore become a greener city while addressing the needs of its citizens and incentivizing using public transportation. Echoing author Bryan Stevenson, who spoke at Loyola during Mission Week, you need to be close to the problems you hope to solve. I recognized a problem with bus stops because it directly affected my life. It was a problem close to me, so therefore the solution was close to me as well. Your idea may be great—but it can always be better. I asked my friends to critique my logo. I proposed the project to bus patrons, engineers, my classmates. They all had valuable input that strengthened my pitch. The experience was exhilarating and I was amazed at how many people responded to my project. I was also thrilled to take second place in the competition! 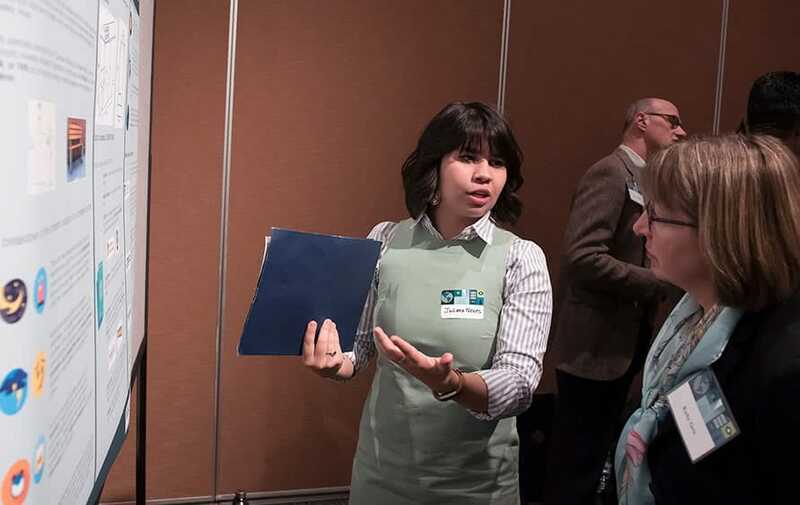 My pitch took second place in the competition, and I was presented a monetary prize by Kathy Getz, Ph.D., dean of the Sellinger School of Business and Crag Vollmer, MBA ’14, vice president of M&T Bank, which sponsored the event. This project and process would not have been possible without the support of faculty who believed in my idea and my abilities: Professors Pascual-Ferra and Keilson, Josh Smith, dean of the School of Education, and Kathy Getz, dean of the Sellinger School of Business, as well as many others who have been teachers and mentors. I am grateful. It’s important to believe in yourself, but when you have others around you who believe in you and your idea, it can make all the difference.